Snapchat introduced the concept of Stories where users could create stories with photos, video clippings, gifs. The concept garnered so much popularity that almost every social media started copying this feature. From Instagram, to WhatsApp, many social media platforms added this feature. Finally Facebook was only left to include this feature. Facebook Stories have rolled out in the major mobile platforms. 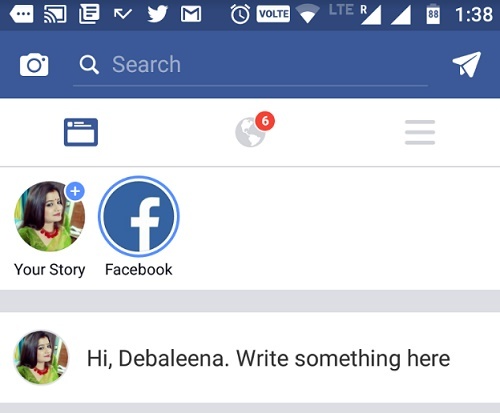 The features in Facebook Stories are exactly same as that of Instagram and WhatsApp. The Stories remain for 24 hours and they vanish after a duration of exactly one day. You can capture photos, video clips up to 9 frames per story. You can insert funny filters like face of animals, head tiaras, pizza going inside your open mouth and so on. The feature look exactly same as that of WhatsApp and Instagram stories in terms of looks. Facebook’s new feature has rendered the same features as Snapchat. You may be wondering why Facebook is implementing the same repetition in all its product apps. The answer is the huge user base of Facebook. even though WhatsApp has an equally large user base, but the Status feature has not been well-received. The user base o Instagram is not that huge as that of Facebook. Hence, Facebook wanted to bring this feature in front of more and more people. This is nothing but a competition with Snapchat. This isn’t going to challenge Snapchat’s user base. The popularity of Snapchat Stories is large. But if any Facebook user who is not on Snapchat, wants to enjoy the concept of Stories, then he/she won’t move to a different app just for the sake of a single feature.